Eliminating gas costs, exhaust, noise and vibration, LineLazer ES 1000 Line Striper comes with Fast Flush™, SmartControl™ and ProConnect™ technology. Striper delivers up to 60 gallons of material on single charge with 2 batteries. Product features on-board charger, spray gun adjustment design with “G” clamp holder and LineLazer cart for continuous stripping and is suitable for factory and warehouse applications. 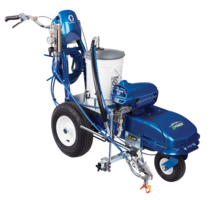 Graco Inc. (NYSE:GGG), a leading manufacturer of fluid handling equipment, is pleased to introduce the LineLazer® ES 1000, the first professional battery-powered airless line striper in the U.S. that delivers power and performance without engine exhaust or noise. The LineLazer ES 1000 is a true technology breakthrough for striping contractors who want to expand their business to indoor, limited noise or populated-area applications with a quiet, clean alternative power source without sacrificing performance. Ideal for factory and warehouse applications, the LineLazer ES 1000 replaces high-cost manual taping and paint marking methods. The LineLazer ES 1000 features high-output electric battery power that eliminates gas costs, exhaust, noise and vibration while delivering crisp lines. The ES 1000 can deliver up to 60 gallons of material on a single charge with two batteries. The on-board charger maximizes performance and enables plug-in charging without battery removal. The LineLazer ES 1000 also features a new innovative spray gun adjustment design with “G” Clamp holder system and the proven performance of the 495 PC Pro Pump, Motor and Drive system with Fast Flush™, SmartControl™ and ProConnect™ technology for quick and easy use and years of uninterrupted performance. Finally, it features the exclusive LineLazer Cart for all-day striping comfort. To learn more about Graco LineLazer ES 1000 and all LineLazer stripers visit www.graco.com/LineLazerES1000. Graco Inc. supplies technology and expertise for the management of fluids and coatings in both industrial and commercial applications. It designs, manufactures and markets systems and equipment to move, measure, control, dispense and spray fluid and powder materials. A recognized leader in its specialties, Minneapolis-based Graco serves customers around the world in the manufacturing, processing, construction and maintenance industries. For additional information about Graco Inc., please visit us at www.graco.com.